The Victory Lap (aka The NIT) rolls on into the weekend. Naturally on my way home from Tuscaloosa I was told to head back there for a Friday set day and a Saturday 11 AM CT start. So it's T-Town times two in one week. A) Take two flights (SAV>ATL>BHM) and then a 1-hour drive. 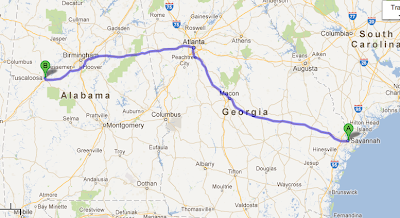 The list time on the Atlanta-to-Birmingham portion is under an hour and back one time zone. So for example, a flight that leaves Atlanta at 12 PM will arrive in Birmingham at 11:55 AM. About this phenomenon, former ABA star Marvin Barnes once famously said, "I ain't gettin' on no time machine." 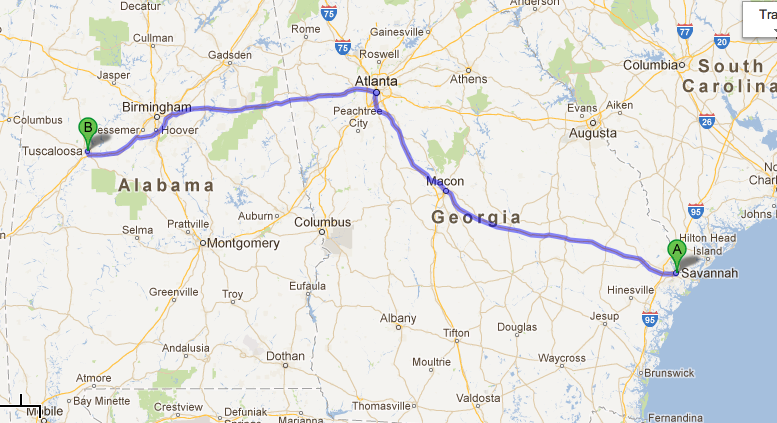 B) Fly to Atlanta and drive 3 desolate hours to the University of Alabama. Watch for speed traps! C) Bite the bullet and just drive 6 1/2 hours. Take your own car and you can rack up mileage expenses. If you add up all the time spent, all 3 options are actually pretty close, it's just a question of how you want to spend the time. You can't get any work done in the car, but you have a little more flexibility in how you want to break up your trip. And if you're driving around the long stretches of the Alabama interstate, there's one other thing to worry about: dry counties. There's nothing more disheartening than pulling up to a Ruby Tuesday on the back end of your drive and not being able to get a drink. See ya in T-Town this weekend. Method of transport: TBD.